Idealism. Exploration. Ideas. Eclecticism. Experimentation. Exploration. Chicanery. What do we mean when we say "New Age"? The last half of the 20th century was a unique period of spiritual search in America. Other periods may have had a like intensity, but the enormous inpouring of esoteric knowledge and practices, the great numbers of people involved and the concomitant impact on culture make the New Age phenomenon extraordinary. Though hard to define, the origin of the concept of the New Age is quite old. While Swiss psychiatrist Carl Jung, founder of the archetype-based Analytic Psychology, is commonly thought to have been the first to speak of a new age, it was only in 1940 that he wrote a new era was dawning, "the meridian of the first star in [the age of] Aquarius...the premonitory earthquake of the New Age." Much earlier, in 1907, the distinguished literary critic, Theosophist and later Gurdjieff student, Alfred Richard Orage, bought and edited a little-known English weekly, the New Age. He soon made it into one of the most distinguished cultural, political and literary publications of its day. Three years earlier, the notorious black magician Aleister Crowley was proclaiming the "New Aeon of Horus, the Crowned and Conquering Child." And of course, the Theosophist Alice Bailey was also heralding it. But esotericists and occultists were speaking of it at Rosicrucian and Masonic lodges at least as far back as the 1700s. Through the centuries talk of the New Age germinated through its various iterations until the 1960s when suddenly it burst from simply an idea to a living reality. The modern esoteric seeds of the New Age were planted long before the 1960s by G. I. Gurdjieff, who brought the perspective and practices of the ancient esoteric teaching of The Fourth Way to the West in 1912 and whom many people regard as "the father of the New Age." Should Mr. Gurdjieff have known what would come to pass in the 50 years following his death in 1949, he would have no doubt parted his enormous mustache and laughed uproariouslyand for those understanding how to listenwith an undertone of great sadness. The West, particularly America with its economic and military strength, needed to awaken to a higher level of consciousness. The world was approaching a decisive primary octave in which it would either ascend or descend. A great shock had to be given. To introduce an esoteric teaching, long kept secret, was a great risk. Knowing that and the resistance that awaited, Gurdjieff accepted the mission. His plan was to open an institute to train helper-instructors who would then spread the teaching. When this proved unfeasible in the time allotted, he then conceived of hurling the teaching into the future by means of three series of self-initiatory esoteric books. Closing the institute in 1924, he then began to write. It would be 25 years later, after many experiments and revisions, that on October 21, 1949, Gurdjieff held the first proofs of the American edition of his First Series of All and Everything. "I now very tired," the 77-year-old Gurdjieff said, "and I know that when I finish this last book my work will be done. So now I can die, because my task in life is coming to an end." The next day Gurdjieff, suffering from cancer, summoned a student, J. G. Bennett and told him: "It is the beginning of a new world. Either the old world will make me 'Tchik' (squash me like a louse), or I will make the old world 'Tchik.' Then the new world can begin." In other words, the esoteric teaching he brought would either awaken to a new level of consciousness or level the teaching to that of ordinary understanding. The following night Gurdjieff again called for Bennett, telling him that when All and Everything was published, he wanted his pupils to spread it throughout the world. "In future times," replied Bennett enthusiastically, "next year will be called year One, because it will start a new age." On October 29, 1949, eight days after first seeing the proofs of his magnum opus, Mr. Gurdjieff passed on. The disparate groups in the various countries had to be organized. 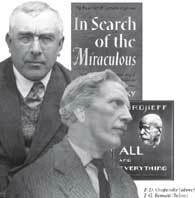 In the emotional turmoil that followed, P. D. Ouspensky's In Search of the Miraculous was immediately published, while Gurdjieff's All and Everything was not published until the following year. Though each is a masterpiece on its own level, In Search of the Miraculous quickly overshadowed All and Everything to become the book of choice. The reason was simple enough. Ouspensky's text systematized the teachingthat is, what Ouspensky had understood of it, as he left Gurdjieff shortly after Gurdjieff came to Europe in 1921setting it forth in a logical, compellingly readable and intellectually satisfying way. Gurdjieff 's text, being initiatory, was intentionally demanding, its knowledge "salted" throughout, its sentences structured so their meaning would arise only with a concerted effort of attention. There are periods in the life of humanity which generally coincide with the beginning of the fall of cultures and civilizations, when the masses irretrievably lose their reason and begin to destroy everything that has been created by centuries and millenniums of culture. Such periods of mass madness, often coinciding with geological cataclysms, climate changes and similar phenomena of a planetary character release a very great quantity of the matter of knowledge. Contemporary culture requires automatons. And people are undoubtedly losing their acquired habits of independence. And turning into automatons, into parts of machines. It is impossible to say where is the end of all this and where the way outor whether there is an end and a way out. One thing alone is certain, that man's slavery grows and increases. Man is becoming a willing slave. He no longer needs chains. He begins to grow fond of his slavery, to be proud of it. And this is the most terrifying thing that can happen to a man. A day would come when the Eastern world would again rise to a position of world importance and become a threat to the momentarily all-powerful, all-influential new culture of the Western world, which was dominated by Americaa country that was very strong, to be sure, but also very young. Afterward, in the 1920s, in talks given at his Institute for the Harmonious Development of Man, Gurdjieff said that the fundamental purpose of all leaders, messiahs and messengers from the gods was to find some means by which the two sides of the earth could live together in peace and harmony. [Gurdjieff] said that time was very shortit was necessary to achieve this harmony as soon as possible to avoid complete disaster. Philosophies, religions and other such movements had all failed to accomplish this aim, and the only possible way to accomplish it was through the individual development of man. As an individual developed his own, unknown potentialities, he would become strong and would, in turn, influence many more people. If enough individuals could develop themselveseven partiallyinto genuine, natural men, able to use the real potentialities that were proper to mankind, each such individual would then be able to convince and win over as many as a hundred other men, who would, each in his turn, upon achieving development, be able to influence another hundred, and so on.... The separate, distinct growth of each individual in the world was the only possible solution. Immediately following his passing, Gurdjieff was attacked venomously in the French press. Rumors abounded, faux books were published, only years later to be recanted, but the damage had been done. Understandably, Gurdjieff's students stayed underground, retreated into the hermetic. Now, what was happening in ordinary life at that time? America, Russia and England, joining together in a unified and tremendous act of will, had defeated Adolf Hitler's utopian vision, stunted as it was, of a Thousand Year Reich that would stop what he saw as the world's mechanical movement toward gross materialism. There was a confidence, a quiet certitude, a rising belief that a new time had begun. Mankind could not afford another world war with the advent of atomic and hydrogen weapons. A solution had to be found. Time, indeed, was short. So sexual liberation joined with the birth control pill and psychedelics to further spur the belief in a utopian vision of a new world, one which would free itself from the terror of the Bomb and its Dr. Strangeloves and initiate a new non-militaristic, non-materialistic society. These, in simplified form, were the guiding and driving beliefs of what came to be known as the New Age.